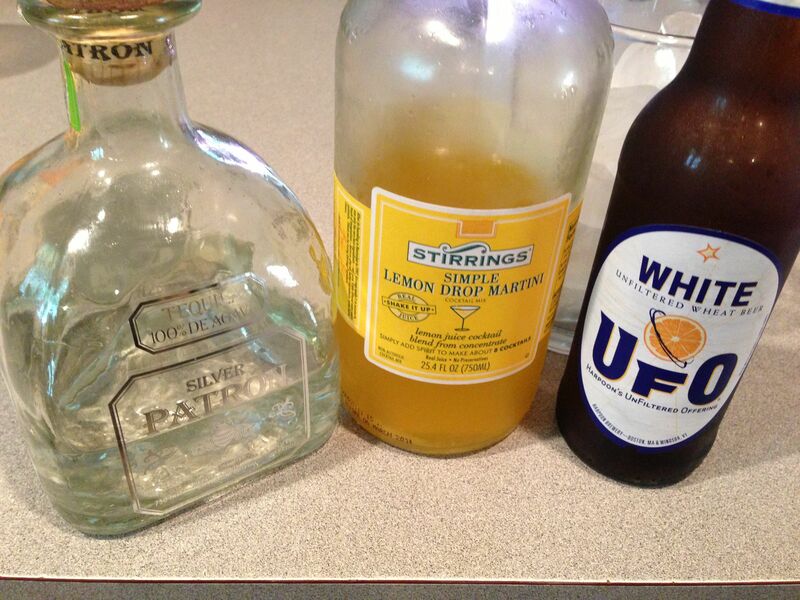 A tequila-beer cocktail for people who don’t like tequila or beer, made with only three ingredients. If you’ve ever had the pressure-filled situation of having twenty limes, a bottle of good tequila and a group of assembled guests waiting for delicious margaritas to come out of your kitchen (or bar) then the post is for you. Because that’s happened to me. A lot. And no matter what I do, I can’t get it right. The recipes I have tried, whether in books or web sites, fail to produce the same kind of yummy-give-me-more Margaritas that I have experienced at even the worst Mexican-themed bar or restaurant. One of the reasons I started blogging in the first place was that through knowing people who run restaurants, I gradually understood that in many cases, you COULD NOT produce results like you had in the restaurants. This is because you weren’t using the same ingredients: they knew secrets about ingredients that make things retain their color (Chinese restaurants use sugar on their greens); had access to certain things you don’t (who’s got a vat of MSG, for instance? ), and they use things you wouldn’t think of (I was surprised to find out steakhouses generously coat their steaks with butter to finish them…is that why they’re so good?). But I had a great experience with a tequila drink at Hungry Mother in Cambridge. The drink is no longer on the menu, but at the time it was called a #57. It was so spectacular that I couldn’t stop thinking about it days after I had it. Even when I knew the ingredients, I couldn’t replicate it, so I wrote to them asking for the recipe. To their great credit, they sent it to me, but even after following their instructions, it wasn’t as good as it was there. Atmosphere to blame, perhaps? The original recipe was in ounces and called for 3/4 oz of Becherovka, which is a mysterious drink you are unlikely to have in your liquor cabinet; it comes from the Czech Republic is green and has a flavor that is hard to describe. Ultimately, I couldn’t make my drink taste that good with it, so I dropped it out, and you know what? I found that by removing the Becherovka, I got it the way I wanted it. A great tasting, Hard Lemonade flavored and simple (three ingredients) drink loved by people who don’t like either tequila or beer! (I can provide references if you doubt me). Over ice, pour the following. Mix vigorously and serve. Now, you might want to play with the ratios to get it the way you like it, and certainly if you are going to make a pitcher, math will be involved. But I promise you, you will be asked to make it over and over again! Posted in Food Writing & Other Stuff, Uncategorized and tagged Beer, Cocktails, Hard Lemonade, Perfect Summer Drinks, Robert Deutsch Drinks, Tequila on August 17, 2014 by Robert Deutsch.